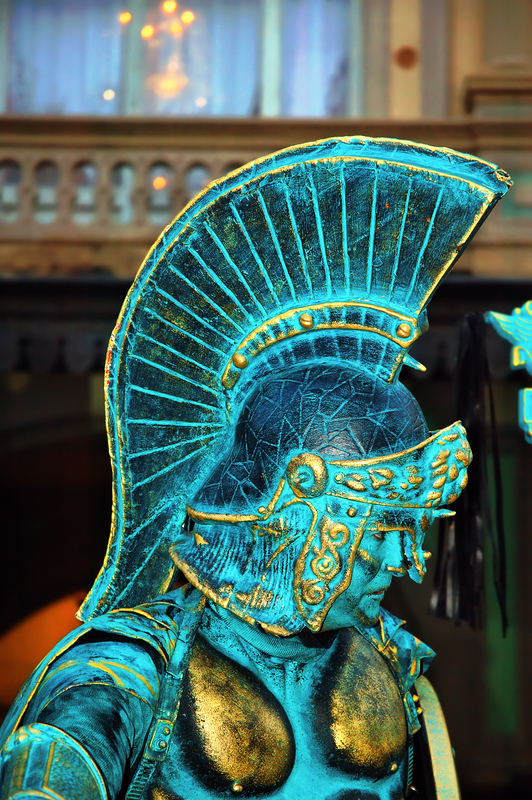 Roman, Greek, Persian or whatever the warrior's armor is (I recommend you visit this place for more information: Helenic Art - Armors) I am sure you won't remain indifferent in front of this human statue I photographed at sunset just in front of the Liceu concert hall in Las Ramblas, Barcelona. All previous artists I caught in full daylight so I guess my first night shot is somewhat different and mysterious. Any lead concerning history and armor origin would be appreciated. Impresionante el traje y la personificación, y mucho más la foto! No traje, na estátua e na fotografia. Que fotógrafo o Carlos é! Wow, is that a real person?! Oh, gosh! Another one I didn't get to see. This is probably the best one yet!